The Carolina Panthers host the Tampa Bay Buccaneers at Bank of America Stadium on Sunday, December 24, 2017. The opening line for this game has Carolina as 9.5 point favorites. The over/under has been set at 46.5. 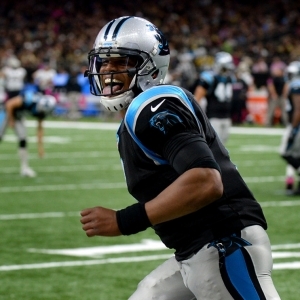 The Panthers have an over/under record of 9-5-0 and they are 9-5-0 against the spread. The Buccaneers have an ATS record of 4-9-1 while their over/under record is 7-7-0. The Tampa Bay Buccaneers have run for 1,274 yards as a team, which ranks 27th in the NFL. They've run 337 times, averaging 3.8 yards per carry as a rushing unit. The Buccaneers have been penalized on offense 90 times for 708 yards so far this season, which has them 20th in the league in penalties. They are 21st in the NFL in points scored with 285. They have run 896 plays this season for 4,969 yards, which ranks them 11th in the league in total offense. The Buccaneers average 5.5 yards per play, which is 13th in the National Football League. As a team they have accumulated a total of 304 1st downs this year, placing them 4th overall as an offensive unit. Jameis Winston averages 7.6 yards per pass attempt and 11.9 yards per completion. He has completed 233 passes on 364 attempts for a completion percentage of 64%. His quarterback rating is 93.6. He has thrown for 2,774 yards this season. The Buccaneers rush defense has allowed 383 attempts for 1,673 yards this year, putting them in 23rd place in the league against the run. Tampa Bay has committed 96 penalties for 849 yards on the defensive side of the ball this season. That ranks them 22nd in the NFL. They've given up a score on 38.1% of possessions on defense, which is 24th in the league. They are 22nd in the league in points allowed on defense with 336. They have surrendered a total of 5,471 yards on D, which is 31st in the NFL. The Buccaneers are ranked 32nd in yards per play allowed with 6.1. Their pass defense has given up 7.4 net yards per pass attempt, placing them 31st in the league as a unit. Opposing offenses have completed 333 passes on 493 attempts against the Tampa Bay Buccaneers defense this season, placing them 31st and 25th in the National Football League. The Tampa Bay pass defense has also given up a total of 3,798 yards through the air, which is 32nd overall in total pass defense. The Tampa Bay Buccaneers have attempted 28 field goals this season and made 20, which is 21st in the National Football League. Their kickers have a field goal percentage of 71.4%. Tampa Bay Buccaneers kickers have made 93% of their extra points, going 25 for 27 this year. Their punters have totaled 2,707 yards on 63 punts, averaging 43 yards per punt. That places them 31st in the NFL in punting average. Tampa Bay is ranked 31st in the league in punt returns with 20. They've accumulated 192 punt return yards and average 9.6 yards per return, which is 8th in the NFL. Their longest punt return so far this year is 44 yards. They have returned 17 kicks for 383 yards on special teams, ranking 31st in kick return yardage. The Buccaneers average 22.5 yards per kick return and have a long of 50 yards this year. They are 17th in the league in all-purpose yards with 5,726. The Carolina Panthers are 12th in the National Football League in points scored with 331. They have run 907 plays this year for 4,676 yards, which ranks them 17th in the NFL in total offense. The Panthers average 5.2 yards per play, which is 18th in the league. As a team they have accumulated a total of 285 1st downs this season, ranking them 11th overall as an offensive unit. On the ground Carolina has run for 1,900 yards as a unit, which ranks 4th in the league. They've run 435 times, averaging 4.4 yards per rush as a unit. The Panthers have been penalized on offense 72 times for 597 yards so far this year, which has them 32nd in the NFL in penalties. Cam Newton has passed for 2,962 yards this year. He's completed 261 throws while attempting 433 passes for a completion percentage of 60.3%. His quarterback rating this season is 85.4. He averages 11.3 yards per completion and 6.8 yards per pass attempt. Carolina is 11th in the NFL in points surrendered on defense with 286. They have given up a total of 4,311 yards on D, which is 5th in the league. The Panthers are 15th in yards per play allowed with 5.2. Their pass defense has allowed 5.8 net yards per pass attempt, ranking them 10th in the National Football League. Opponent offenses have completed 302 throws on 478 attempts against the Carolina defense this season, ranking them 19th and 17th in the league. The Panthers pass defense has also surrendered a total of 3,028 yards in the air, which is 11th overall in total pass defense. Their rushing defense has given up 303 attempts for 1,283 yards this season, putting them in 5th place in the NFL against the run. The Carolina Panthers have had 82 penalties for 735 yards on defense this year. That places them 7th in the league. They've allowed a score on 31.8% of possessions on defense, which is 10th in the NFL. Carolina is 5th in the NFL in punt returns with 37. They've totaled 300 punt return yards and are averaging 8.1 yards per return, which is 19th in the league. Their longest punt return this season is 60 yards. They have returned 27 kicks for 561 yards on special teams, placing them 21st in kick return yardage. The Panthers average 20.8 yards per kick return and have a long of 33 yards this season. They are 16th in the National Football League in all-purpose yards with 5,740. The Carolina Panthers have tried 26 field goals this season and made 25, which is 15th in the league. Their kickers have a FG percentage of 96.2%. Carolina kickers have made 94% of their extra points, going 32 for 34 this season. Their punters have accumulated 2,819 yards on 61 punts, averaging 46.2 yards per punt. That ranks them 12th in the NFL in punting average. Who will win tonight's Buccaneers/Panthers NFL game against the spread?